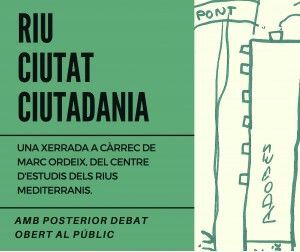 Discussion with Marc Ordeix from the Centre d’Estudis dels Rius Mediterrànis, and debate, “Reclaiming the Méder: how, who, and for whom”. An activity connected to the project Afluents, based upon a collaboration between Seila Fernández Arconada and A+, as part of the CAPP project, co-produced by Hablarenarte and ACVic, with the support of Europa Creativa (EACEA) and Acción Cultural Española (AC/E). Since 2001, Marc Ordeix i Rigo has been the coordinator of CERM, Centre d’Estudis dels Rius Mediterranis, a lecturer at the Universitat de Vic - Universitat Central de Catalunya, linked to the Museu del Ter, at Manlleu (Osona), whose objective is the encouragement of research, awareness-raising and conservation regarding the river Term and, by extension, other Mediterranean rivers. Afluents is a collaborative project about the bed of the river Mèder as it flows through the Tanneries district. The project brings together and activates processes in the context of the river, the Tanneries district and the town of Vic. Afluents considers the river as symbolic of Vic’s industrial, environmental and social past and present.